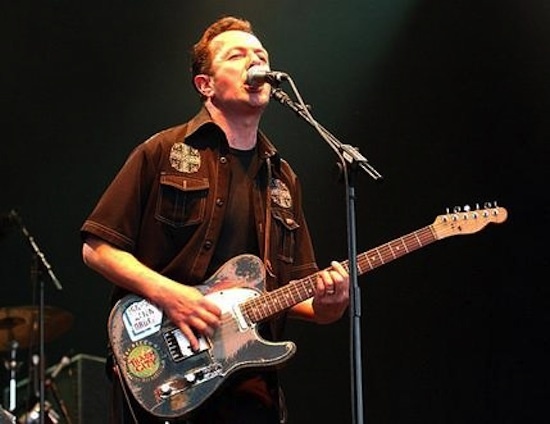 Fifteen years ago today Joe Strummer made his sudden and untimely transition. His words and music have had, and still have, a huge impact on my life. I took the below photo in the spring of 2012 (I think). It was a mural on the side of a bar, Niagara, at the corner of East 7th and Avenue A in NYC's East Village. In 2003 graffiti artists Zephyr and Dr. Revolt paid homage to Joe a few months after his death. Someone told me that they came back every year to touch it up. But then, a few years ago, the wall had to be repaired so it was removed, much to the dismay of pretty much everyone. Since then there is a new version of it up, though I still prefer the original which is pictured. 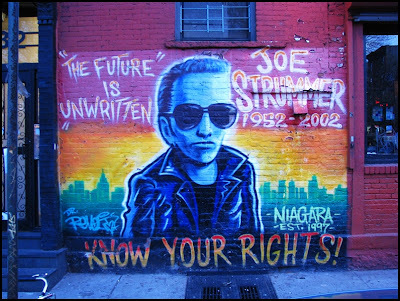 Anyhow, at the bottom of this post is a truly moving video of the artists painting the mural while Joe Strummer sings his rendition of Redemption song as a backdrop. What is interesting is that at one point, towards the beginning, the filmmaker puts a clip of Joe Strummer in the crowd as if he was watching it being painted. Anyhow, if you have a few minutes I hope you'll watch it. The music alone is worth the watch, but seeing the faces of the people watching is really moving. Turn it up.